Bring the Books: Why No #JusticeForGators? It would be difficult to argue that June was a good month for Orlando, Florida. From the horrible and nearly unimaginable evil committed by an ISIS-loyal terrorist, to the two-year-old child who was taken by the alligator in the lagoon at the Magic Kingdom, it was a month with a lot of bad news and very few bright spots. It is the sort of month that leaves all God-fearing people crying out for justice and the consummation that will come with Christ’s return. The reaction to the alligator attack is of particular interest, because it is a nearly identical situation to what happened with Harambe the gorilla about two weeks before. In that event you may remember that a small defenseless child also stumbled into the habitat of a dangerous creature. In that event also the child was attacked. The difference is, of course, that in this instance the child’s life was tragically taken by the dangerous creature before something could be done about it, and in the other instance the gorilla was shot in order to save the child. In the aftermath of the Disney alligator attack five alligators have been found in the lagoon and killed. Because the outcry on behalf of Harambe was so loud, I was certain we would hear animal rights activists demanding #JusticeForGators… speaking of the “murder” of these majestic, once endangered creatures as if it had been their brother or their uncle. However, that doesn’t appear to be the case. 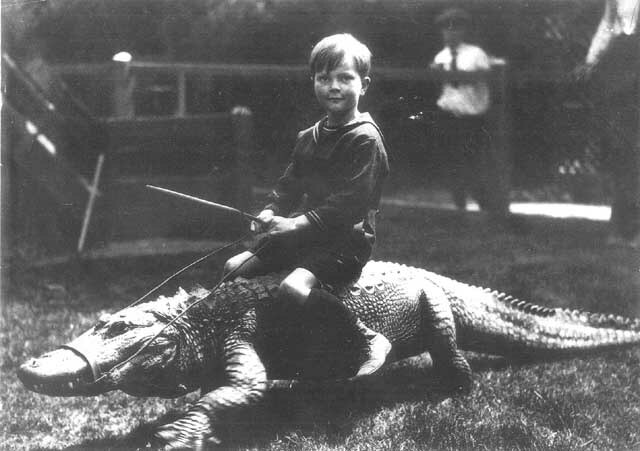 A Twitter search for #JusticeForGators yields only an animated GIF of a child riding on the back of one of these lovely, hilarious, and not at all dangerous animals. What accounts for the selective outrage? I suspect it is because, on the one hand, people have forgotten that only a few years ago these very animals were listed as an endangered species. It was only 1987 when the USFWS declared the alligator as “recovered” as a species. But that analysis assumes, rather charitably, that the public are somewhat rational, but simply forgetful. On the other hand, I suspect that there are some creatures that are simply easier to anthropomorphize and imagine that they are your pet or your friend. When people saw Harambe, they didn’t see a one ton meat tank that could crush a coconut with its bare hands – they saw their hairy uncle (including the grey back hair). Cecil the lion was a deadly, dangerous predator whose species has terrorized humans living in the regions of Africa that they inhabit, but at least films like The Lion King gave them a humanized portrait of what the animal could be seen as (if they squinted right). But what of the gator? Well, the friendliest portrait we’ve seen of alligators is the crocodile who ate Captain Hook’s hand. No wonder no one is asking for #JusticeForGators! Perhaps what alligators, as a species, need is their day in the sun – a Lion King equivalent so that the capricious sentiments of the American public can be emotionally maneuvered into defending another killing machine as if it was their favorite pet. I am not anti-alligator, nor am I anti-gorilla. I am, however, pro-sanity and pro-consistency. Until I see protestors outside Disney demanding that someone answer for the “murder” of these slimy, scaly, terrifying, majestic creatures, I will continue to wonder whether there is a species-ist selectivity among people who think that animals and humans are morally equivalent.